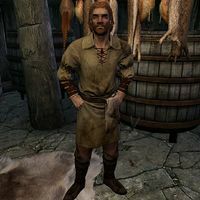 Thoring, a Nord food vendor, is the owner and proprietor of the Windpeak Inn. He is the father to the inn's bard, Karita. Thoring's wife died two years previously, and his daughter is concerned by the fact that her father is working too much. He gets up at 8am, and from there immediately gets to work at the bar, only taking breaks to eat at noon and 8pm. After a long day, he finally goes to bed at midnight. He wears a set of barkeep clothes and a pair of shoes. He is equipped with an iron dagger, and carries a key to the inn as well as a selection of common items and gold. He seems pretty spacey and generally out of it, and often will remark: "I'm sorry. My mind was just somewhere else. Did you need a room? Drink?" and "Oh, do you need a room?" When the town is still infested with nightmares, he'll reassure you: "Need a room? Don't worry. Nightmares don't seem to happen for travelers." Sometimes he will also mention his daughter, saying: "My daughter Karita sings to the guests when she can. She has her mother's voice." When asked about rumors, he'll warn you: "Everyone in town knows about the Black Door, and to never go near it." If Hail Sithis is complete he will then say: "Did you hear? People have been seen coming in and out of the Black Door. Divines have mercy." This page was last modified on 19 January 2014, at 02:40.